While Florida State University fans will be rooting on the Seminoles as the NCAA basketball tournaments get underway this week, the university can already claim a national title — in student success. Florida State topped a field of 68 schools to win the 2019 national championship of student success, according to the Eduventures Student Success Ratings, which are used to rate schools based on their student success records and identify best practice institutions. “Student success is at the heart of our mission at Florida State, so it’s exciting to be recognized nationally for our commitment in this area,” said Sally McRorie, provost and executive vice president for Academic Affairs. To answer that question, Eduventures used its student success ratings as basketball scores in this year’s NCAA Division I men’s basketball championship bracket. Florida State won the “tournament” with a student success rating of 73. Joining FSU in the “final four” were Auburn, Virginia Commonwealth and UC Irvine. Eduventures Student Success Ratings take into consideration a performance model of how institutions “should” perform given the students they serve, along with the institution’s historical trends. While the ratings are not about absolute retention and graduation numbers, Florida State boasts the best four-year graduation rate in the state of Florida at 72 percent, as well as one of the top first-year retention rates in the nation at 94 percent. As for the real brackets, both the FSU men’s and women’s basketball teams were selected for the NCAA championship tournaments. The Florida State men’s squad is the No. 4 seed in the West Region and will meet No. 13 Vermont at 2 p.m. Thursday, March 21, in Hartford, Connecticut. The FSU women’s team is seeded No. 5 in the Greensboro Region and will face 12th-seeded Bucknell at 4 p.m. Friday, March 22, in Charlotte, North Carolina. “We know our basketball teams strive for excellence on the court and in the classroom, and we wish them the best of luck throughout the tournaments,” McRorie said. 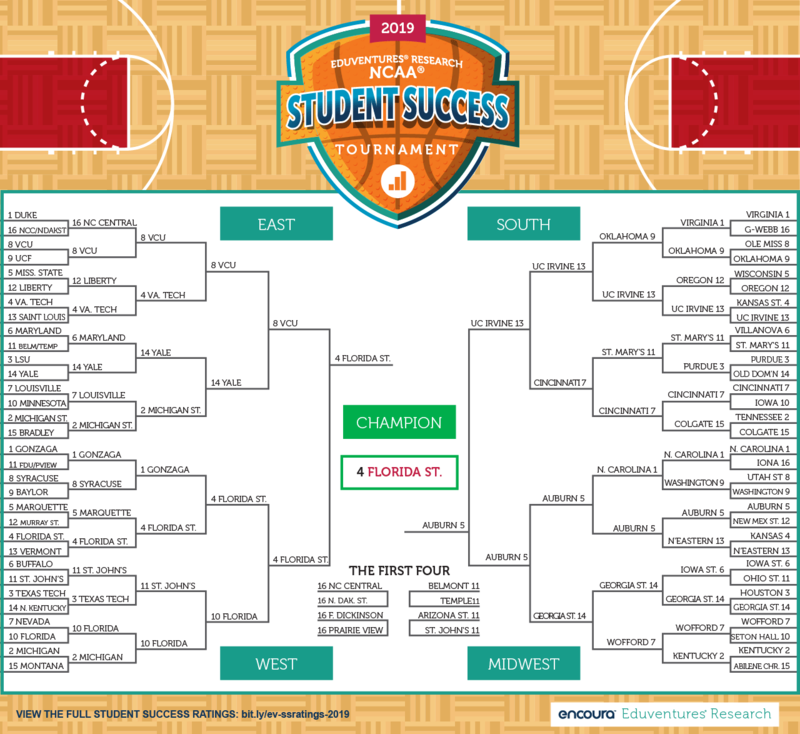 For the full list of student success ratings, visit https://encoura.org/2019-student-success-tournament-florida-state-reigns/.